Carrying on in the IPP series, today I'm looking at Mr Puzzle's IPP31 exchange puzzle "Houdini's Torture Cell". I was lucky enough to be given this one as a gift from my fiancée for my birthday, after dropping a few hints. Mr Puzzle (Brian Young) is great at making sure that his exchange puzzles are relevant to the location of that year's IPP, and this is no exception. The puzzle celebrates Harry Houdini’s first public performance of The Torture Cell at the Circus Busch in Berlin on 12th September 1912. A small copy of the original poster from that show is printed on the presentation card as you can see below. 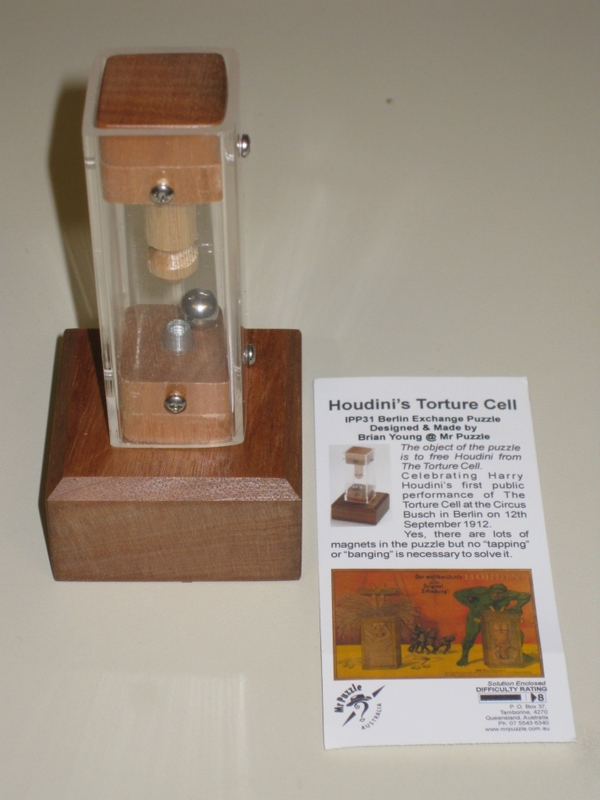 As the info card states, the object of the puzzle is to free Houdini from the torture cell. For those not familiar, during this illusion, Harry Houdini was suspended by his feet, locked through the top of the box which was filled with water, and escaped without drowning. Now having performed this illusion myself many years ago while I was still doing magic, I can confirm that there was no steel ball in the bottom of the tank, however the puzzle does recreate nicely the shape of a suspended figure, with no apparent way to escape. The puzzle is very well made, as with all of Brian's puzzles. 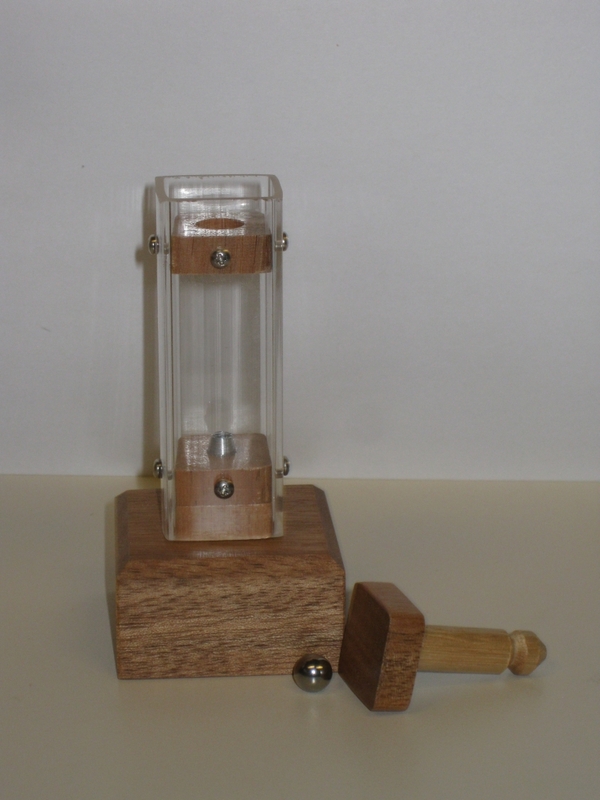 The puzzle makes use of the wood and perspex together to create a very sharp looking puzzle. On the bottom of the puzzle you'll find the Mr Puzzle Logo branded into the wood. Despite the very visible screws, there's no screw driver required to solve the puzzle, so you can stop thinking along those lines! At just under 4" tall, and a little under 2" square at the base, this is a good sized puzzle, and feels good in your hands when you're working on it. Not too small that it's fiddly. 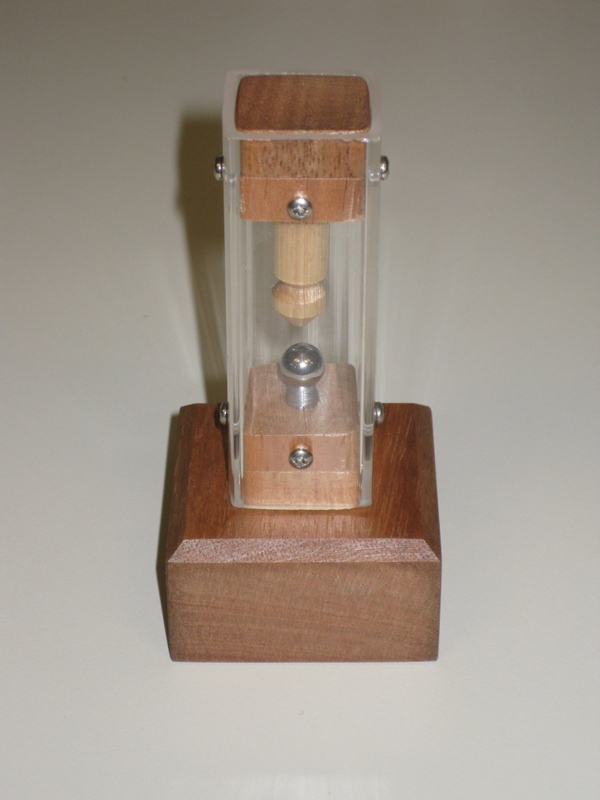 If you're a seasoned puzzler, you'll be tempted to get the compass out for this puzzle, as Brian states that there's lots of magnets, but no "tapping" required to solve the puzzle. You'll find a very strong magnet in the base, and a couple of others elsewhere. The question is what to do with them. On the Mr Puzzle website, Brian states that the idea for Houdini's Torture Cell came from one of the locks in the incredibly complex "The Opening Bat" puzzle. Brian felt the idea was unique and very satisfying to solve so he revisited the idea and changed it to present in a way that would suit IPP; this way it's available for lots more people to experience a great 'Ah Ha' moment. And the Ah Ha moment in this puzzle is excellent. The beauty of the puzzle is that everything is on show for you, so really you can; after a quick investigation; think about how to solve the puzzle and then go ahead and solve it. Well, when I say everything, I mean almost everything is on show for you. There's a little bit of discovery required, and you'll need to find a tool or two hidden in the puzzle to help you solve it, but everything you need is right there in front of you. If you really get stuck there is a solution provided in a folded piece of paper, so if you don't want hints, don't unfold that paper. The puzzle's party piece as I think of it is that once you've figured out how to solve it, you can leave it sitting on the shelf with the metal ball balanced on the podium at the bottom of the puzzle. Trust me, there's no way you're going to be able to get it there with dexterity alone, and leaving it in this state not only makes it look great on display, but also makes people wonder how on earth you got it there. I highly recommend this to any and all. It's a brilliant little puzzle, and solving it is a lot of fun. I have to agree with Brian's thoughts, that this is a very satisfying puzzle to solve, and I'm really glad he decided to make this version of the puzzle as it's unlikely I'll get the chance to play with an Opening Bat. With Christmas coming up, this would make a great gift for the puzzler in your life. To see what other people think of it, read Allard's review and Oli's review for another perspective.